Tamaño desta vista previa en PNG do ficheiro en formato SVG: 570 × 300 píxeles. Outras resolucións: 320 × 168 píxeles | 640 × 337 píxeles | 800 × 421 píxeles | 1.024 × 539 píxeles | 1.280 × 674 píxeles. Orixe No machine-readable source provided. Own work assumed (based on copyright claims). Autor No machine-readable author provided. SKopp assumed (based on copyright claims). This file is in the public domain because the Marshall Islands have very limited laws on copyright and this work does not fall under them. The Marshall Islands are not party to any relevant international convention or treaty regarding copyright (details, overview). For this template to be applicable, it is not enough that a work be published in the Marshall Islands - the author must be a Marshallese citizen and not have any other citizenship, and they must be ordinarily resident in the Marshall Islands at the time of publication. If these factors are not all met, then the work can still have an enforceable copyright outside of the Marshall Islands. Additionally, unpublished works can be the subject of copyright outside the Marshall Islands. The Unauthorized Copies of Recorded Materials Act, 1991 grants some Marshallese works limited, internal, intellectual property rights over sound and audio-visual recordings only. For more information on the status of Marshallese works, see here, here and here. 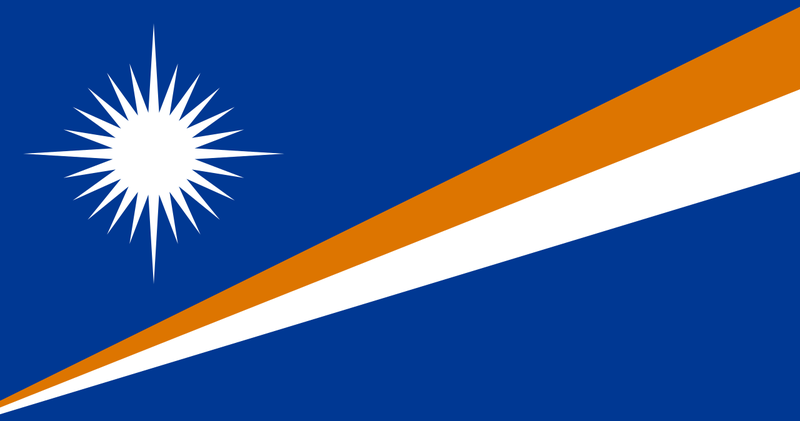 The flag of the Marshall Islands has the greatest number of star points. 5 de marzo de 2012 ás 06:28 684 × 360 (7 kB) Schwei2 thumbnail? 5 de agosto de 2011 ás 06:58 684 × 360 (1 kB) OAlexander~commonswiki Cleaned up code, enabled view-boxing, added "title"-tag. 22 de outubro de 2005 ás 18:42 574 × 302 (2 kB) Zscout370 This was the flag that was drawn by Gmaxwell.